A Huntington Beach resident marked his 2,000th consecutive visit Thursday to the parks of the Disneyland Resort. Jeff Reitz, a Disneyland Resort annual passholder, began his daily sojourns to Disneyland and Disney California Adventure Park on Jan. 1, 2012, according to Disneyland Resort officials. Back then, the resort was putting the finishing touches on Cars Land, which opened that summer. Reitz, a 44-year-old Air Force veteran, was unemployed when he started his streak and was looking to keep up his spirits. "It was something to do to keep things fun," he said. 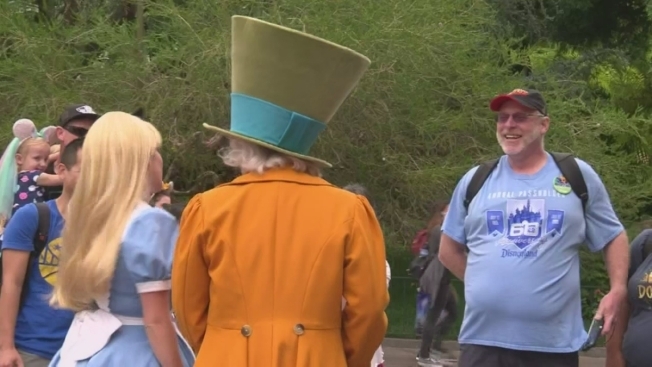 A Huntington Beach man has set a record for most consecutive visits to Disneyland. Jeff Reitz, 44, has visited the park 2,000 times in a row. Reitz started visiting the park every day when he was unemployed and wanted to keep his spirits up. Employed at the VA now, Reitz continues to visit every day after work because it helps him to decompress after a long day. His favorite ride is the Matterhorn Bobsleds, which he first rode with his mom when he was 2 years old. He had initially intended to end his daily visits after a year, but decided to keep the streak going. "I'm still having fun with it," Reitz said. "That's the only reason I'm still doing this. It wasn't about going for records or anything like that. That was a bonus. It's about coming and enjoying the magic of the park." Now that Reitz has a regular day job again at the VA Long Beach Healthcare System, he typically spends evenings at the park. "He said it helps him decompress at the end of the day," Disneyland spokesman John McClintock said. McClintock isn't aware of any other attendance streak that would compare. "I do think that it's an unbreakable record," he said. Reitz has experienced the newest attraction, "Guardians of the Galaxy-Mission: BREAKOUT!" in Disney California Adventure more than a dozen times and says he's looking forward to seeing the nighttime spectacular "Fantasmic!" when it returns in an enhanced version on July 17 at Disneyland. But the Matterhorn Bobsleds, which he first rode as a 2-year-old with his mom, is his favorite attraction. "I'll go on that, rain or shine," he said.